OK, I apologize in advance. Am I allowed to delay the theory talk for a second and complain for a minute? I hope you said yes because that’s what I’m going to do. This season started oh-so promisingly. We had a cast almost full of superfans; we had a bunch of compelling characters who seemingly came to play; we had some really cool challenges at the beginning of the season; and we really seemed to have very few boring cast members. 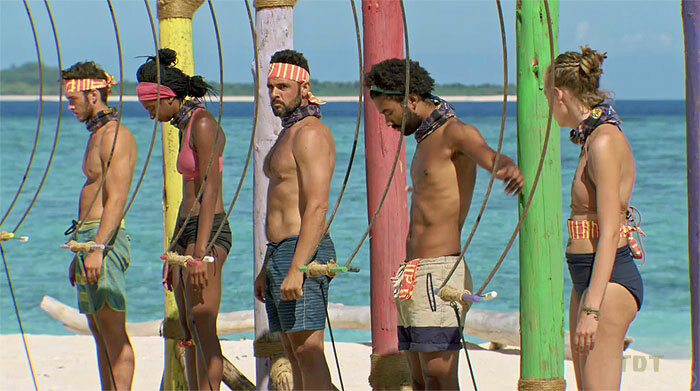 Well, the superfans seem to have forgotten strategy; many castaways stopped playing; the boring run of balance/endurance challenges started; and most of the boring cast members stuck around to the final eight. 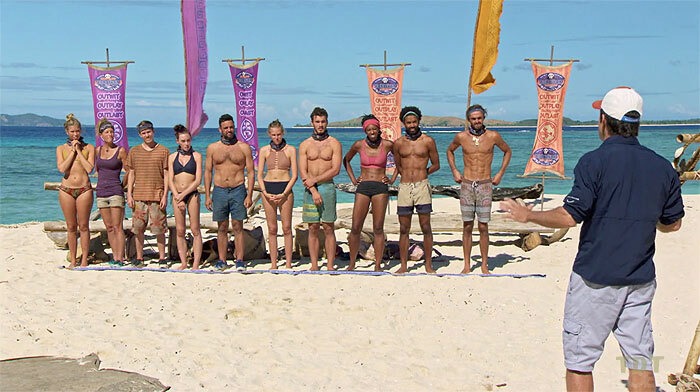 Oh, and I think we can safely say the Ghost Island twist is not so good… to put it nicely. 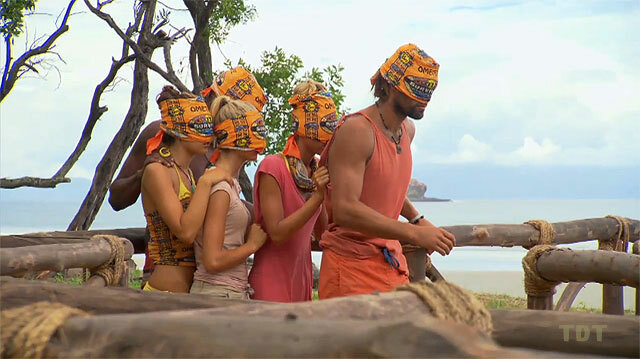 I hate to say it, but this season’s turned into Redemption Island II: Another Horrid Post Merge Season. People might have rightly blocked season 22 from their minds, but Redemption Island actually started really well… before it became a coronation for Boston Rob. The pre-merge game, before Russell got the boot, actually featured good gameplay and some interesting strategy. Then the merge came and, if you were me, you just wanted the season to end already. And I say that as someone who really wanted Rob to finally win a season. This season is falling into that trap. At first, many of the castaways seemed to be playing to win. Now, not so much. At this point, it’s Dom and everyone else. You could charitably say that Wendell and Kellyn have played good games. 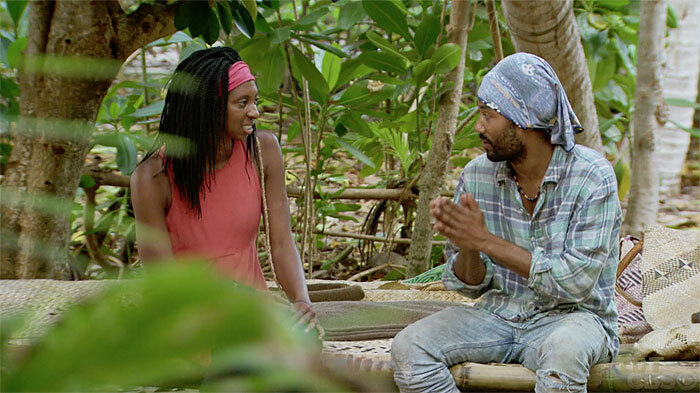 But Wendell seems content to lose to Dom at final tribal and Kellyn’s strategy, at some point, devolved into screaming “Naviti Strong” over and over, regardless of how moronic that strategy might be at the moment. So how do we explain such bad gameplay? We had what seemed like good players and then, for example, we have Kellyn and Laurel the last couple weeks? To me, we need to look at the theory of cognitive dissonance. As per usual, this theory comes from social psychology. Introduced by Leon Festinger, an MIT psychologist, what does the theory say? Well, you’ve probably heard the term before: Cognitive dissonance theory basically describes the mental anguish and indecision a person goes through when they hold two or more incongruous views at the same time. When two opposite views are in a person’s mind, they usually just believe the long-held one, regardless of evidence. This theory tends to be applied, lately, in political studies. I’m not a big fan of talking politics here, but let me give you an example. You may have conservative views and that’s cool, but there are, according to studies and recent polls, a lot of people who think Donald Trump is an honest person. You might like some of his views, but everyone knows he’s a borderline pathological liar… except for a segment of the population. That’s explained by cognitive dissonance. They voted for the man, thought he’d make a good president and admitting he’s a liar would be too hard. So regardless of the evidence, they hold to that belief. Cognitive dissonance. We can see that playing out with Kellyn and Laurel right now. Both came into the game looking like great strategic players. Both earned those reputations during the early game and even in mid season. But now? Well, they’re both hanging on to strategies that clearly aren’t working. With Laurel, deep down there is no doubt she knows she can’t beat Wendell or Dom, but she doesn’t care. She’s sticking to the strategy and probably thinks she can win… despite the evidence. Kellyn is even more frustrating because she’s wielded some power at times in the game but simply can’t get away from a Naviti-based strategy. To us watching, we know they both are heading down a horrid path. And, again, I would argue, they know it too. But cognitive dissonance prevents them from acknowledging this inevitable ending. They’ve both had their plans for so long that they simply refuse to believe they’re not working. Despite every shred of evidence. That, my friends, is the literal definition of cognitive dissonance. Angela: We’re basically at the end and due to her inability to play the game or lousy editing, we still have no idea whether Angela even thinks she has a plan. So far, the only real “strategy” of hers we’ve seen is to put a bunch of attention on the person already the focus of all the attention. Sebastian: SeaBass seems like a pleasant enough dude, but he’s literally never mentioned strategy all season. I don’t believe he even cares about winning. And for all the Ozzy comparisons in the preseason, he’s not even good at challenges. He’s more like this Ozzy than that Ozzy. Chelsea: As mentioned by True Dork Times fearless leader Jeff earlier this week, Chelsea’s done well in challenges and basically voted the right way at every tribal (minus one), yet she’s never shown. And despite a clear jury case at this moment, we know she’ll never win because of this bad editing job. Donathan: Did anybody watching really believe Donathan would ever use his idol on someone other than himself? I don’t mean that in a negative or selfish way; nothing we’ve seen all season suggests Donathan’s going to be much of a strategic standout. He was always going to get nervous and use the idol when he didn’t have to use it. I would have bet money on that. So, I guess this is a good example of editing. Domenick: Throughout this season, I’ve been saying Dom wouldn’t win, if only because people would never take him to the end. Now, I’m all in. He’s got Laurel and Donathan basically spoon-feeding him information with no intention of every voting for him. And this week we learned Dom knows he needs to get rid of Wendell, but we haven’t seen the same acknowledgment from Wendell. Laurel: My Winner Pick™ remains in the game. That’s impressive. But this week, oh man did she disappoint me. Going to Dom and Wendell and asking them how she should play? What the heck is she thinking? Laurel is a smart woman; why wouldn’t she realize she’s starting to play a horrid game? At first, she looked so promising; now, she looks like a goat. Kellyn: Well, here’s another case of someone playing a good game throughout, but completely folding once under any pressure. Kellyn’s been in a great spot all season, never really in any danger. I don’t believe in clutch hitting in baseball necessarily, but there’s no doubt some people love playing under pressure. What we now know? Kellyn is not one of those people. Wendell: For many episodes, it looked like producers were giving Wendell the Winner’s Edit™. I don’t think so anymore. He seems to be content to go to the end with Dom … and that’s not a good idea. And with that, let’s hope this post-merge game starts to pick up as we move toward the finale.